The combination of the international financial crisis and the deep erosion of much of Cuba’s export capacity in recent years by policy errors and natural disasters, resulted in a very serious liquidity shortage, forcing the government to further curtail essential imports. It also led to extraordinary measures to enhance the liquidity of the Central Bank and other state banks. Among these was the wholesale freezing of hard currency assets deposited in Cuban banks by subsidiaries of foreign companies. Other measures included the severe rationing of foreign currency to government enterprises, suspension of payments to foreign trade creditors and greater use of barter trade with Venezuela to generate cash flow. This paper examines available data regarding Cuba’s international liquidity in recent years and the extraordinary measures taken by the government. Finance to Cuban national entities by international banks declined markedly in the two years between December 2007 and December 2009, according to data from the Bank of International Settlements (BIS). 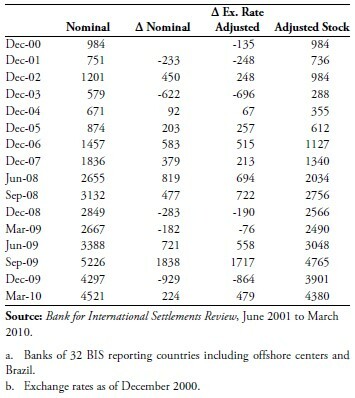 In that two-year period, total loans and other finance by banks in the 42 developed and emerging countries and offshore centers that report to the BIS fell by $951 million, from $2935 million to $1984 million.1 This decline is mostly the result of an actual reduction in financing flows and not of exchange rate fluctuations. When adjusted for exchange rate fluctuations. the decline in financing was $895 million during the same two-year period. Preliminary BIS data for the first quarter of 2010 shows a further fall of $159 million. Figure 1 shows that the stagnation and decline of bank financing to Cuba is part of a secular trend in the last ten years, which was accelerated by the international financial crisis of 2007–2009. The figure measures bank lending in current US dollars, euros and in dollars of constant December 2000 exchange rates. 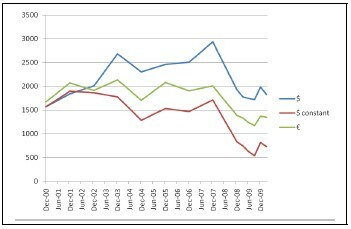 This last measure shows the sharpest contraction, stressing an even more severe fall in real financing than the data would show in current dollars or euros.2 Data on the term structure of lending at the end of 2009 shows no change in the estimated average maturity of loans of recent years at about 1.4 years. Most bank financing to Cuba is trade finance, and apparently extended credit lines have comparable terms in spite of Cuban requests for longer tenors. The shrinkage of trade and other credits has forced the Cuban authorities to pay cash for many food, medicine, parts and other essential imports that heretofore had been financed by bank credit lines. This requires Cuban banks to post collateral for letters of credit and other instruments in the form of deposits at international banks. The data clearly shows such a build-up of Cuban hard currency assets in international banks. The build-up in Cuban assets started in 2004, well before the onset of the international crisis. This was likely prompted in good part by the need to import foodstuffs and other essential goods from the United States and other countries which required payment up front. By December 2007, Cuban banks held $1.8 billion in assets in international banks. With the onset of the financial crisis, Cuban assets increased by one billion dollars in 2008 to $2.8 billion, and reached a peak of $5.2 billion in September 2009. In the last three months of 2009, Cuban assets diminished by $929 million. Even after adjustment for exchange rates the reduction was $864 million (please see Table 1). Though exchange rate movements are the source of great volatility of the series, after adjustment for this effect Cuban international assets still more than tripled from $1.3 billion to $4.4 billion in the two and a quarter years to the end of March 2010. Figure 2 graphs the currency composition of Cuban assets. The figure suggests that in recent years Cuban banks have kept deposits denominated largely in euros and dollars. Importantly, the data in constant exchange rates confirms the underlying rising trend. The reversal of the buildup in assets in the last quarter of 2009 is possibly the result of easing by the authorities of the draconian measures that undermined the operations of foreign companies in the Island by sharply curtailing or freezing access to foreign exchange in the companies’ own accounts. There also took place some easing in exchange controls applicable to domestic enterprises. Accumulation of assets continued in the first three months of 2010 when Cuban deposits rose $224 million. Cuba’s international liquidity is necessarily influenced by export revenues. Nickel prices in particular are a key variable, since the metal accounted for nearly 40 percent of merchandise exports in 2008 (50 percent if one excludes re-exports of refined oil products). Part of the build-up in reserves and other assets in the first part of 2008 is probably explained by lagged receipts from nickel exports. World nickel prices peaked in the first quarter of 2008 at about $33,000/ton (see Figure 3). The subsequent sharp decline to about $10,000/ton in the last quarter of 2008 and the first quarter of 2009 certainly stressed Cuba’s external finances. 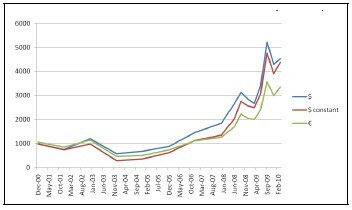 The recovery of nickel prices beginning in April 2009 undoubtedly helped boost export receipts and international liquidity. Weakness of nickel prices in 2010 apparently derives in part from a shift in supply in the Far East. Newly developed sources of low grade mineral in the form of so-called nickel pig iron is being used in China in steel making and other uses, easing demand for high grade metal from traditional sources such as Cuba, Canada and Russia. In the face of a collapse in bank lines and declining cash flow from exports, the authorities resorted to a drastic freeze of bank accounts denominated in convertible pesos or CUCs3 held by foreign companies. The companies were first notified of the freeze in November 2008. According to some estimates, assets frozen reached some $1 billion by February 2009.4 This figure does not correlate with the BIS deposit data, suggesting that the freeze initially implied the accumulation of arrears to CUC deposit holders as a mechanism to divert existing liquidity to other uses deemed a higher priority by the authorities. Even to the extent that Cuban banks held hard currency reserves against the CUC deposits, it would not initially by itself enhanced overall liquidity. As time went on, government banks added to the arrears by issuing un-backed CUCs to foreign companies in payment for supplies or in some cases as a means to nominally fund profit or services remittances. 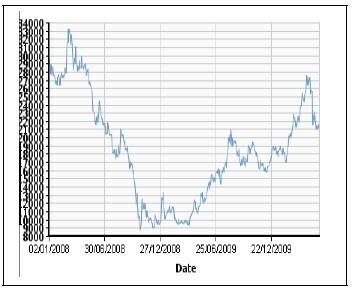 This would be an element explaining the rise in Cuban hard currency assets after March 2009. It was reported that in July 2009 the government was allowing release of some funds in foreign company accounts under a new decentralized control mechanism for foreign exchange.5 The mechanism was described in Central Bank Instruction No. 3 of 2009 and was said to affect up to some $1 billion in frozen accounts. Central Bank Instruction No. 3 also forced suppliers to extend credit terms from 360 days to 720 days.6 Additional anecdotal evidence from a few foreign companies indicates that the Cuban government has relaxed the freeze on foreign assets and that some foreign companies were no longer subject to the freeze by March 2010.7 It was reported that in February 2010, state banks offered a non-negotiable payback plan for frozen bank accounts. This amounted to an involuntary rescheduling of short term deposits to 5 years at an interest rate of 2 percent. 8 Exact figures as to the amounts involved in this rescheduling are not available. A rough estimate is in the range of $500 million to $1 billion. The asset freeze and its haphazard implementation, the involuntary rescheduling of frozen assets and the imposition of payments terms to suppliers will do little to enhance the image of Cuba as a partner in trade or business ventures. This in turn fortifies the position of suppliers that demand cash payment as the only reliable mechanism for doing business in Cuba. Currency controls of course are not anything new in Cuba and operate alongside the dual-currency system. The lack of working price, interest rate and foreign exchange market mechanisms results in the forced allocation of foreign exchange and becomes counterproductive by engendering import misallocation and accompanying corruption. It also makes potential adjustment policies, such as currency devaluation, less effective, and the government feels that it must resort to quantitative controls in the form of import and payments restrictions on companies and government agencies. In this section the currency allocation of Cuban assets in international banks is examined. This topic is not as central as the discussion of currency control mechanisms discussed above. Nonetheless, available data enables a bit more precise analysis of an element of the Cuban government’s management of international liquidity and allows some tentative conclusions about the aims of policy. An adequate currency allocation of liquidity should be aligned with the country’s pattern of international trade. Short-term fluctuations in reserve currencies should not be a major consideration as long as assets are properly matched to underlying requirements. 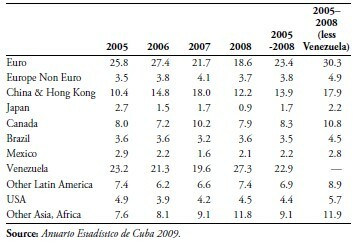 Table 2 shows Cuba’s merchandise trade by currency area 2005–2008. When broken down by currency area, the euro zone narrowly defined comprises 30 percent of Cuban trade, excluding Venezuela from the total and 23 percent if Venezuela is included. We choose to exclude Venezuela from the calculation because trade between Cuba and Venezuela is not subject to ordinary trade financing. It is barter trade subject to conditions and settlement mechanisms that are unknown publicly and that encompass a dominant political dimension. The broad euro currency area could include other European countries whose currencies broadly track the euro in foreign currency markets. This would give the euro a 35 percent weight. Canada’s trade weight is a bit over 10 percent, largely because of nickel smelting operations and other trade in minerals. Plausibly one could include the Canadian dollar in the currency allocation. In recent years this would have been a winning position given the appreciation of the looney in world currency markets. But nickel is priced in US dollars in the most important metal market, the London Metal Exchange (LME), and elsewhere. This adds weight to the argument below about the case for a large allocation to US dollars in the currency reserve mix. The dollar area can be treated as the residual since many currencies in Asia and Latin America show some link to the dollar as the reference currency or as the case of China and Hong Kong, operate within a narrow trading range with the dollar. Also, as we just mentioned, Cuba’s commodity exports such as nickel and other minerals are priced in US dollars. Practical considerations also support the dollar as a reserve currency, since as a matter of liquidity, accessibility and availability of adequate financial instruments, it remains the most widely used currency involved in international trade. Table 3 exhibits a plausible currency composition of Cuba’s international liquidity. Roughly one-half dollars, one-third euros and the rest Canadian dollars and yen. This can be compared with the estimated actual currency composition of Cuba’s external assets. This can be derived from BIS data showing exchange rate adjustments referred to above. By matching the BIS estimates of the exchange rate effects with actual trading values of the currencies, the euro share of deposits can be placed in recent years at close to 70 percent as can be seen in Figure 4. This should not come as a surprise since Cuban banks have forged special relationships with euro zone banks in Spain, France and Germany, although it raises the question as to why a closer matching of assets to trading patterns is not taking place. One possible explanation is the existence of new trade finance and settlement mechanisms with China, Brazil, Argentina and other countries which ordinarily would conduct much of their trade in US dollars. Nonetheless, one still must presuppose other elements of a political nature or perhaps deriving from advise received from commercial bankers. Cuba and Venezuela are essentially engaged in barter trade with a huge concessional component. By any account the terms of trade are enormously advantageous to Cuba. Cuba receives very inflated payments in cash and petroleum for its health, education and security services to Venezuela.10 Undoubtedly this relationship has become a critical lifeline for Cuba. There is evidence that during the critical 2007–2009 period, Venezuela increased shipments of crude oil to Cuba which were in turn re-exported as refined products providing sorely needed external cash flow. The critical element of Venezuelan aid to Cuba consists of the provision of some 93,000 barrels per day of crude oil at highly concessional terms.11 Depending on prices for Venezuelan crude, the annual value of these imports in recent years has oscillated between $2 billion and $3 billion. The exact financing terms for these imports are not known, but the minimal concessional element is sought to be the 47 percent grant component of Petrocaribe terms.12 In practice it is thought that implicit payments for Cuba’s health, education and security advisors in Venezuela finance much of what remains in the oil import bill beyond the available financing schemes of PDVSA, the Venezuelan state oil company. It was reported by PDVSA that Venezuelan oil shipments to Cuba increased from 93,000 to 115,000 barrels per day in 2008, of which 27,500 b/d was presumably PDVSA’s equity share delivered to the jointly owned Cuban-Venezuelan refinery in Cienfuegos. 13 At the same time, according to the Cuban Ministry of Foreign Trade Cuban exports of oil products amounted to $880 million in 2008.14 At the prevailing average of Venezuelan crude oil prices (Tia Juana) for 2008, the value of the Venezuelan contribution to the Cienfuegos refinery would have been $984 million. Since the shipments were distilled products, their exact value may have been higher that estimated here. Moreover, the actual cashflow obtained from these new exports of oil products is also unknown. Part of the refinery’s exports may be shipped to Caribbean countries as part of the Petrocaribe and ALBA (Bolivarian Alternative for the Peoples of the Americas) schemes15 and may be financed at concessional terms. However, recent industry information suggests that the bulk of the Cienfuegos refinery’s shipments are sent elsewhere and are being settled in cash. It can be inferred from the above rough calculations that the barter trade with Venezuela contributed substantial emergency financing for the strapped Cuban government during the financial crisis. The mechanism under which revenues are shared in the joint PDVSA-CUPET projects in Cuba is not known. The data suggests that these arrangements are used to provide further financial support to Cuba and that the operating mechanism for the arrangements may be altered as the need arises. The recovery in nickel prices since the Spring of 2009 is a positive sign for Cuba’s export income even as nickel prices continue to lag other metal prices. Nevertheless, mismanagement of agriculture and industry and the mistreatment of foreign creditors and investors, on the other hand, suggests continuing serious problems in Cuba’s external cash flow. In this situation, it is expected that some temporary measures, such as the diversion of Venezuelan origin oil to export markets will become permanent. And the rescheduling of CUC accounts of foreign companies is piling more debt unto Cuba’s accounts. Many of the tough measures taken by Cuba to enhance its international liquidity are counterproductive and place the country in a vicious circle. Freezing foreign accounts and suspending payments to trade creditors add to the Island’s long history of external debt default. The consequence is that even more foreign suppliers and exporters will only do business on a cash basis, such as for example, on the basis of fully collateralized letters of credit. This in turn forces the Central Bank and other Cuban banks to maintain higher hard currency cash balances to sustain needed imports, further straining foreign exchange availability for investment and consumption. In this situation, Cuba has reached again to Venezuela as a lender of last resort to help provide much needed hard currency, a situation that allows the government to keep delaying the deep policy changes needed to improve production and exports. 1. The December 2009 figures from the BIS are provisional. Revisions are usually not significant. 2. The sharper decline in constant dollar financing in relation to dollar and euro financing implies some lending took place in currencies that appreciated relative to those two, such as the Brazilian real, Canadian dollar and Russian ruble. There is no detailed public data about the currency composition of lending. The nationality of known bank lending is concentrated on French, Spanish and German banks but they may lend in several currencies. Currently many emerging country banks including those from Brazil and Russia report lending data to the BIS, and they may account for about 20 percent of bank lending to Cuba. 3. CUC 1 = $1.08. 5. Reuters, “Cuba unfreezes some bank accounts to boost trade,” July 22, 2009. 6. Reuters, “Cuba continues to block access to business bank accounts,” September 30, 2009. 7. “Cuba no longer freezes foreign funds, Chilean executives tell their government,” Terra News Service, March 9, 2010. 8. Reuters, “Cuba offers payback plan for frozen bank accounts,” March 2, 2010. 9. Reuters, “Cuba continues to block access to business bank accounts,” September 30, 2009. 10. For an analysis of the Cuban-Venezuelan economic relationship see Rolando H. Castañeda, “La Ayuda Económica de Venezuela a Cuba: Situación y Perspectivas—¿Es Sostenible?,” Cuba in Transition—Volume 19 (2009). 11. An analysis of terms for these shipments can be found in Castañeda, op. cit., and in L.R. Luis, “Cuban External Finance and the Global Economic Crisis,” Cuba in Transition—Volume 19 (2009). 12. See L. Luis, op. cit. 13. Reuters, “Oil now second-leading Cuban export,” June 10, 2009. 14. The Anuario Estadístico de Cuba 2008, does not record the oil exports reported by the Ministry of Foreign Trade. 15. Reuters, “Cuban-Venezuela oil refinery startup on schedule,” March 5, 2008. 16. Floor speech by Senator Bob Menendez on December 10, 2009. 17. O Globo, February 25, 2010.